Nexus shortened its usual solo recital program in order to perform Lee R. Kesselman’s “SHONA MASS” with the New Classic Singers under the composers direction. 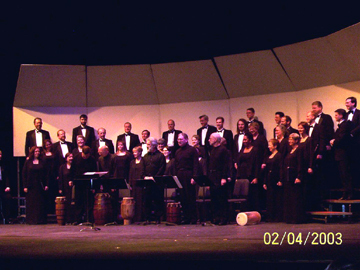 Professor Kesselman is choral director at Du Page and had met Nexus when Doreen Rao performed his work in Toronto with the University of Toronto Faculty of Music Chorus. 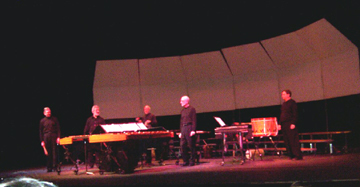 “SHONA MASS” is in four movements with optional percussion parts suggested by the composer. Nexus played its Mbira composition “TONGUES” immediately before the Kesselman work and played some of its collection of African drums, bells and rattles during “SHONA MASS”. It was a wonderful concert and a nice change for our regular program. RUSSELL HARTENBERGER PRESENTED A “HANDS ON” WORKSHOP OF WEST AFRICAN DRUMMING. Thank you so much for the residency at College of DuPage. The performance was superb and has created great food for discussion here at the college. I especially liked THE INVISIBLE PROVERB (by Nexus member Russell Hartenberger) and would welcome the opportunity to purchase it on CD. As for the performance of SHONA MASS — I am greatly honored by your work on my music. It means more than you can know. Thank you for all your gifts and talents. I hope we can work together again sometime in the future.